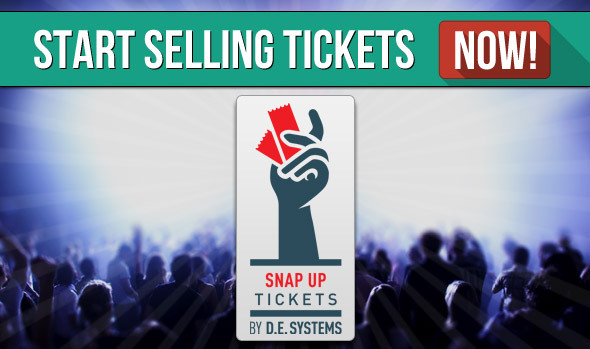 Snapup Tickets - Sell Tickets Online - Event Management Made Easy! Reduce your workload when planning your event! Click here to read more about the Snapup Tickets Checkin Module! Snap Up Tickets® is an online registration system designed to allow the user full access to create, manage and share their very own event. This website based application comes with useful administrative tools to help manage, track and query event activities and registrant data. With online registration forms that are immediately available and secure online payment services, your online event will be ready to go in a snap! Whether you are hosting an event for entertainment, business conferences, tradeshows or seminars; Snap Up Tickets® is key to a successful event. Our easy to use online registration system will start you off with the creation of your own event webpage with many customization options. You can then promote your event through social media such as Facebook and Twitter, sell tickets and be certain that your event will be a success. Snap Up Tickets® is a division of D. E. Systems Ltd with offices in Ottawa and Toronto, ON. D. E. Systems has been providing event technology services including on-line registration for over 20 years. MyConferenceSuite, our on-line registration system complements Snap Up Tickets® by providing a more comprehensive and customizable registration system for major conferences and events, servicing all of North America. For more info on MyConference Suite, please visit our website.